If you don’t already know, our boss is currently trapped in the Amazon. In 1958. Settle down, that’s not the weirdest part. 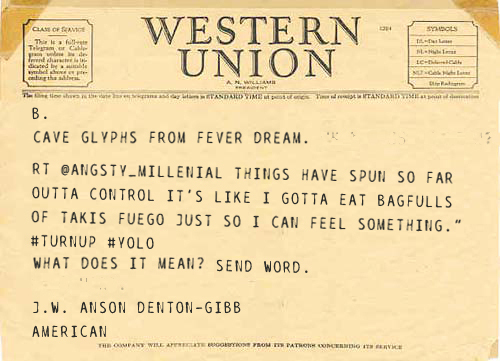 He sends us Western Union Telegrams pretty regularly and we post the best ones. They’re always insane. The boss is insane. Anyway, this just arrived. I don’t have a reaction. We get these things all the time.